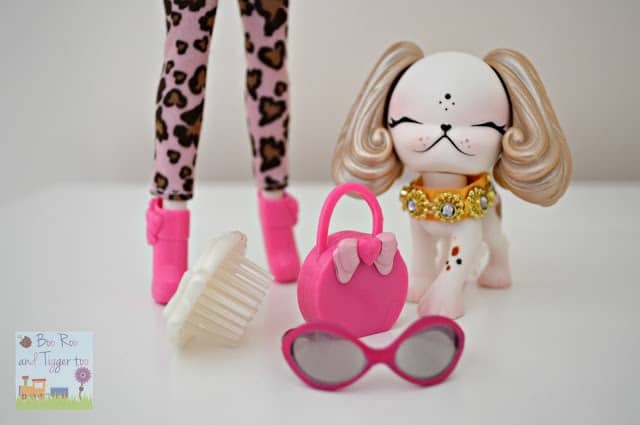 Pinkie Cooper is the ingenious combination of human doll and English toy spaniel who lives in an ‘IT girl’ high fashion world and likes to travel the globe with her best friends, Ginger Jones and Pepper Parsons and their equally stylish pet pooches. As a fashion student at New York’s World of Original Fashion (WOOF! ), Pinkie is set to be more sophisticated, more glamorous and more stylish than her competition. Pinkie and her friends are cute and sweet with a penchant for the cutting edge fashion that their world dictates. Their clothes, accessories and even their long flowing hair are completely interchangeable, meaning Pinkie, her friends and even their pooches can have a new look every day. 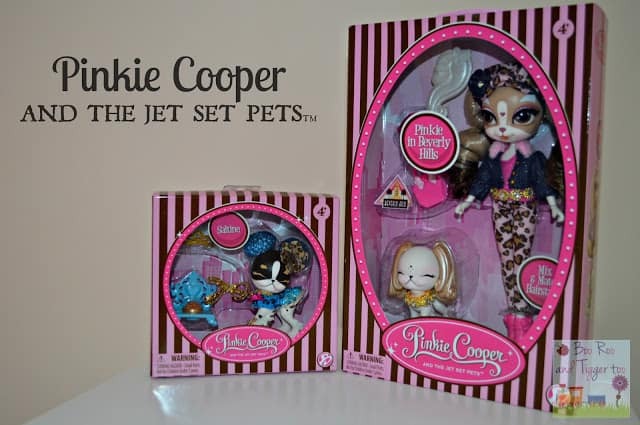 The Pinkie Cooper deluxe travel collection doll and pet set comes in three different options; Beverley Hills, London and Paris. 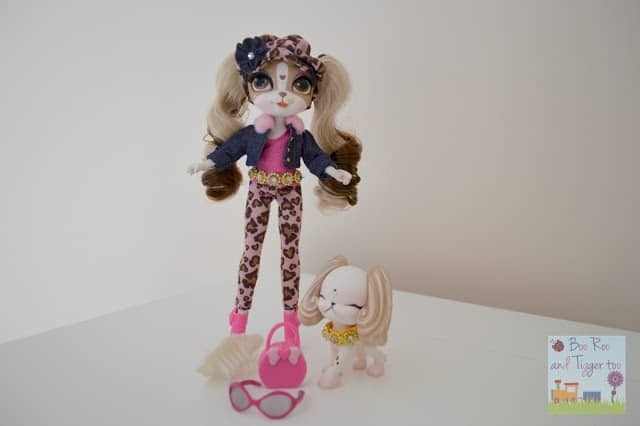 We were kindly sent Pinkie Cooper deluxe travel collection doll Beverley Hills to review. Upon opening the boutique style box which in principal offers your little one the chance to store their Pinkie Cooper away at the end of the day. However upon attempting to remove Pinkie and her pet from the packaging can be a little tricky and we ended up ripping the boutique style box so rendered it useless for storage. Once you have managed to get Pinkie Cooper from the packaging you are able to appreciate the detail that has gone into the facial features, outfit and accessories. As with all of the figures and pets within the Pinkie Cooper range the hair/ears are removable and interchangeable. Pinkie herself does look a little strange when she has no hair or hat on but by adding the hair she is transformed into a cute, friendly doll for your little ones to play and let their imagination run wild with. Within the Pinkie Cooper range there is also a trio of runway collection dolls; Pinkie Cooper, Pepper Parsons and Ginger Jones. 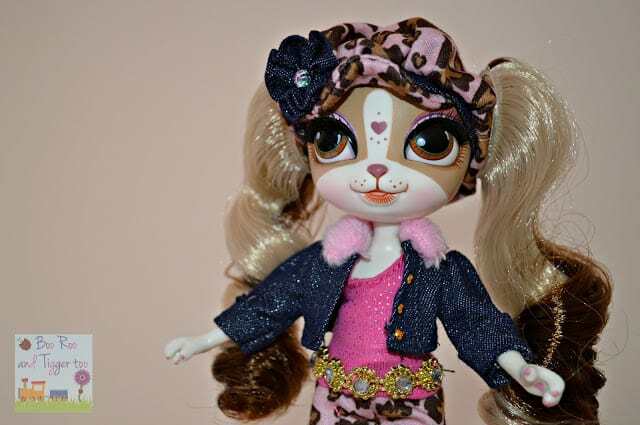 The dolls have interchangeable hair and is kitted out in fabulous runway-inspired fashions and accessories. The dolls and accessories are presented in pretty packaging and includes a travel sticker to collect for adding to your own Pinkie Cooper passport. Any ‘IT girl’ wuld be lost without her beloved Jet Set Pet and Pinkie Cooper and her friends are no different. With three different jet set pets to collect; Saltine, Li’l Pinkie and Sprinkles. We were fortuante enough to receive Saltine to review, the beloved pet of Pepper Parsons, in the Jet Set Pets Collection. 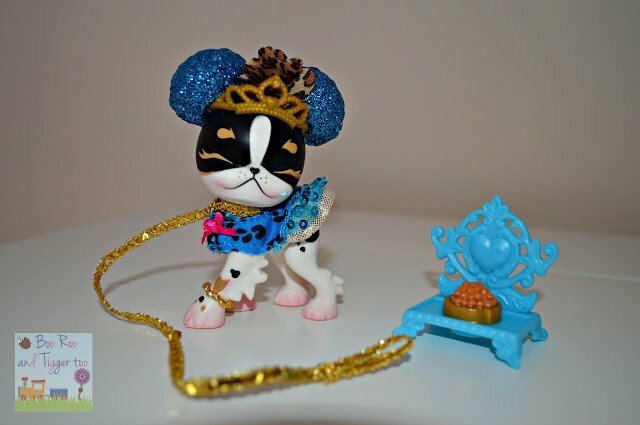 Saltine is dressed in a cute blue sparkly outfit and comes with accessories for pet play, such as a dog bowl ‘throne’ and a tiara! Alongside Pinkie Cooper and the Jet Set Pets there are a range of accessories that enhance and compliment playtime. A lovely party collection fashion sets are available for around £10.00 which include a new set of hair, clothes and accessories for Pinkie to wear. My favourite has to be the Pinkie Cooper Jet Setting Case that can hold all your little ones Pinkie Cooper dolls, pets and fashion accessories. I know that this has been added to Roo’s Christmas wish list. Disclosure Policy: We received Pinkie Cooper deluxe travel collection doll Beverley Hills and Pinkie Cooper Jet Set Pets Collection Saltine FOC for the purpose of review.